Tampa Tarpon Fishing Charters | Local Fishing Guide | Catch the Silver King! Come catch the Silver King! Rod bending, drag screaming, big fish action! Tampa Bay is home to one of the largest annual migrations of tarpon in the world. They literally flood our beaches and bays in droves every spring and summer. Thousands of these giant silvery beasts arrive starting in late April and they meet up with our resident fish who come out of our rivers as they prepare for their annual spawn. There is absolutely nothing like hooking a 100lb tarpon, hearing the drag scream on the reel, and then watching it leap into the air. It is the ultimate inshore game fish. No other fish puts smiles on people’s faces like a tarpon does. Once you’ve hooked one, you’ll be hooked on tarpon for life. 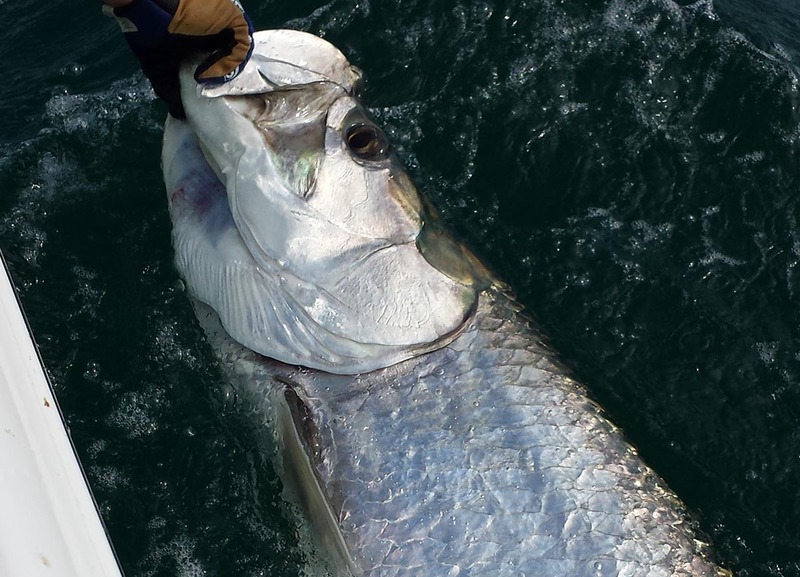 Tarpon season is a very busy time for Capt. Jason. Be sure to book early to get the best dates. If you’ve ever dreamed of catching a fish that weighs as much or more than you do, that leaps into the air, that screams drag and leaves you exhausted but grinning ear to ear when the fight is finally over… then tarpon fishing is for you. I run tarpon fishing charters May, June, & July. Where do I tarpon fish? I run tarpon fishing charters out of O’Neill’s Marina in St. Petersburg, FL. How many people can go on a tarpon fishing charter? 1-3 anglers is ideal. A 4th angler per boat is discouraged but doable. If 4 anglers go in one trip, all 4 angler may not fish at the same time. How many tarpon can you expect to catch? Average tarpon charters hook between 5 and 7 fish. We usually land about half as many as we hook. Some days we hook as many as 20 fish and some days it’s just a few. Very very rarely do we ever get skunked and we have shots at plenty of tarpon on about 99.9% of charters. What’s the average size of the tarpon? Our average fish have gotten bigger and bigger since catch and release has been strongly adopted by nearly all tarpon anglers. Most tarpon we hook are between 80lbs and 120lbs. We usually hook a few each year nearing 200lbs. How long does it take to land a tarpon? Every tarpon has a different attitude. Some jump a lot and some don’t jump much at all. Some make long runs and some just “bulldog” you. The average fight with a 100lb tarpon is between 20 minutes and 30 minutes but I’ve seen some fights go as long as an hour. We try to land fish as fast as possible to ensure the fish can be quickly revived (and also that you don’t get worn slap out). So, I’ll give you pointers during the fight an how we can “whip” the fish as fast as possible. Can we bring a tarpon into the boat for a picture? No. To preserve our fishery and to obey the law, we must keep the fish at least partially in the water. We pull fish along side the boat for pictures. The pictures actually come out very nice this way. What does it mean to “reach” to a tarpon when it jumps (a.k.a. “bowing to the king’)? When a tarpon jumps, we want to reach the rod towards the fish to give it slack. The helps us keep the fish from pulling the hook or breaking the line. This is counter-intuitive to most freshwater anglers and can take a few fish to get used to.